It’s easier to keep down your health insurance costs if you live healthier. However, a lot of health crises are hard to predict. They say that with age comes wisdom, but aging can also bring an increasing amount of health issues that seemingly crop up overnight. Although the overwhelming majority of discomfort is nothing to be concerned about, there are a few symptoms that can indicate serious trouble. Here are four major health concerns to watch for and what you should do if they appear. No symptom involving the heart should ever be taken lightly. The consequences of ignoring any sort of heart issue could be dire and irreversible. Symptoms of heart disease include shortness of breath, tightness in the chest, pain, nausea and unexplainable fatigue. There are a variety of underlying conditions that could contribute to a heart condition, so it is important that you speak with a doctor immediately if you are experiencing any potentially heart-related symptoms. Dental problems can pose serious threats if not treated, and as such, if a problem arises, then it’s better and cheaper to deal with it earlier rather than later. Although the issue might start off as seemingly minor, it can quickly deteriorate to a more serious condition, such as periodontitis, a tooth abscess or receding gums. Poor oral health can also lead to a host of other serious physical afflictions if left untreated. Although it is most likely a benign issue, recurring stomach or gastrointestinal issues should be examined in order to rule out more serious conditions. Everyone suffers from nausea or stomach discomfort every now and then. However, persistent stomach pain can be an indication of an ulcer, gallstones, appendicitis and more. Consulting with a medical professional is always a good idea if the pain continues to reappear. Any shortness of breath not attributed to exercise should be cause for concern and warrants a visit with a medical professional. Difficulty breathing could indicate a heart issue, lung problems, or anemia. If stress or anxiety is affecting your ability to breathe normally, a doctor can provide guidance on how you can relax and regulate your body. That said, you may also experience trouble breathing with an upper respiratory infection, which is treatable with antibiotics. However, if you experience severe breathing problems or wheezing, then you should see a healthcare provider right away. If you begin to experience consistent pains or discomfort associated with any of these areas of concern, it is important to speak with a doctor immediately. Even if the discomfort comes and goes, it is still imperative that a medical professional is consulted so that you can effectively and quickly treat any ailments and prevent them from becoming more serious. Some of your ailments may become consistent and it may become difficult to care for yourself at home. Call us. 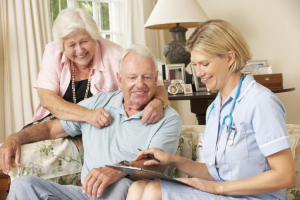 We specialize in homecare and we want to be there for you!